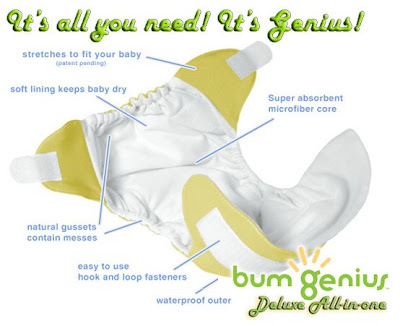 Win a free Bumgenius 3.0 Diaper! This is a valuable All-In-One cloth diaper that you can use for yourself or give as a gift to someone expecting a baby! Go check out Hot Belly Mama's Blog for details on how to win this wonderful All In One Cloth Diaper. Hot Belly Mama will announce the winner on March 30th, after her 30th birthday! Hi! In answer to your question - they do make a one-size 3.0, but all make what they call "perfect size" in small, medium and larges. Rixa -- I love my bGs. That's our entire stash. It's all we've used since robin was 3 months old. BTW, I got the full text of your article via Big Push. Excellent stuff!! Congrats!! What kind of bG's do you have? AIO? pocket? one size fits all or different sizes? Thank you! I am posting another blog tomorrow that includes another giveaway. Answering this weeks late. Sorry, have been busy with our bill! I have the OS pockets. We have been nothing but super happy with them. The wash routine is simple, and they've fit Robin really well since she was 3 months old. She's been in the "biggest" size now for about 5 months and shows no sign of outgrowing them. I don't expect them to last through potty training but I love that our upfront investment of about $400 (we did buy new/in bulk) has lasted so long. We also got a huge bag of them for free from our upstairs neighbor (!!!) so we have an ample stash, close to 30, which means we never run out. We bought before the organic option was available. FWIW I did use some of the bG AIO smalls when she was teeny and ADORED them. I seriously considered doing an all AIO stash because they were so great. BUT they take FOR.EVER to dry. That made me crazy. The pockets take 1 hr for a full load to dry. Pretty nice. I don't know what we'll do for our next newborn since I do think they would be a bit bulky for a teensy baby. But Robin was 8.5 lbs so maybe the next one will be nice and big and ready for the bGs right away. I can't believe you are already at 32 weeks! Other ppl's pregnancies fly by. I felt like mine took forever!